This all alloy beauty was built by Tim Hart and Paul Courbot from Titan Performance in the U.K. Titan specialize in building Suzuki 2-stroke café racers and café racers parts. This 1977 GT500 features a polished alloy TZ tank, polished alloy race seat, Titan Performance polished alloy ‘S’ logo rearsets and Titan polished stainless steel expansion chambers. The motor is basically stock apart from a little tidy up in the ports, 120 mains jets, cone filters and of course the pipes, which look they make a sublime sound. Tim told us the bike isn’t quite finished yet. 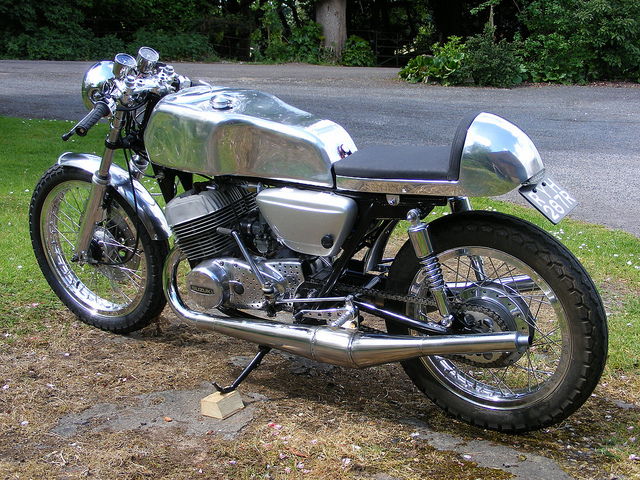 “As with all cafés it’s undergoing constant mods and will soon have a smaller, neater polished alloy oil tank/battery box so we can do away with the huge standard one” Tim said.